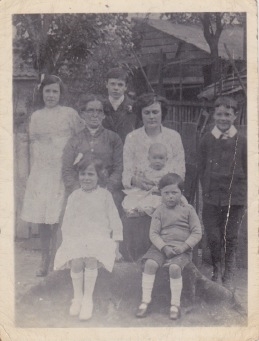 Maude Durrant with her mother-in-law and six children in 1916. 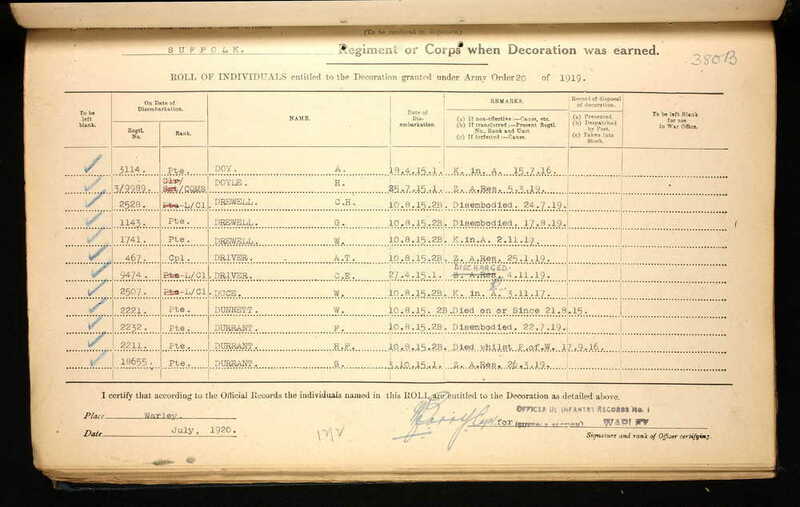 Private Henry Frederick Durrant, or Harry as he was known, was a family man with six children when he went off to war. Sadly, Harry did not return and we tell his story here. Harry was born in Hadleigh in 1879. 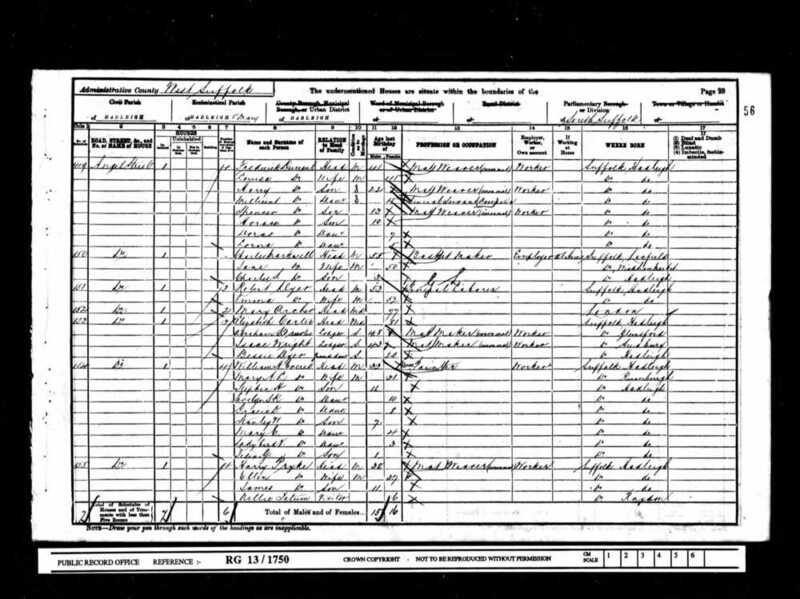 The 1911 Census report him living at home with his parents Frederick and Louisa Durrant and his siblings at 149 Angel Street, Hadleigh. The following year, he married Maude. By the 1911 Census Harry and Maude were living at 8 Angel Street with their four children. 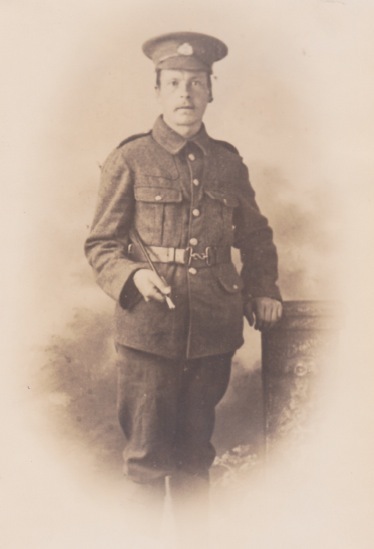 We are not sure exactly when he enlisted, but it seems like many other young men from Hadleigh, Harry joined the local territorial battalion, the 5th Suffolk Regiment. 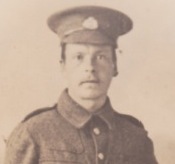 If we assume that Harry had joined the battalion before war broke out then we know that he would have been mobilised on the night of the 4th/5th August 1914. By then Harry and Maude had had two more children. Once the battalion was mobilised they spent a number of months carrying out home service tasks. At that time, the territorial army were under no obligation for overseas service, however, once it became apparent that more troops would be needed for overseas service, the men of the battalion were asked to volunteer. After giving this some serious thought, 72% of the men, including Harry, volunteered and the battalion was redesigned 1st/5th Suffolk Regiment. Those who opted to stay on home service duties only, became the 2nd/5th. Given that Harry was now a 35 years old and married with six children it would have been completely understandable if he had opted to stay at home. Private Durrant was entitled to the above three medals; The British War Medal, the 1915 Star and the British Victory Medal. The 1st/5th Suffolks completed their training and preparation and were re-equipped for service in the eastern theatre. They embarked along with the rest of 163 Brigade and the 54 Eastern Division at the end of July from Liverpool bound for Gallipoli. They arrived and went ashore at Suvla Bay on 10th August 1915 and were quickly moved forward. By midday on the 12th were manning the forward trenches on the Anafarta Plain and at 4pm they were ordered forward as part of a 163 Brigade operation to clear the Plain of snipers in preparation for a much larger Divisional operation that was planned for the following day. The battalion was on the left of the brigade line and 'A' Company made up of Hadleigh men were in the first wave. There was at least 75 Hadleigh men involved and this was a true baptism of fire. They were told it would be a straight forward advance to mop up the odd sniper, but in reality they faced a determined and ruthless enemy. The enemies intimate knowledge of the ground was key. They sniped the Suffolks who could not see the firing points and even if they could, they had no artillery support to combat the snipers. The Turkish made the best use of their own artillery which ultimately halted the Brigades advance. The Suffolks fell back to a shallow river bed / ditch where they formed the new front line. A few days later they were relieved and returned to the reserve trenches where they discovered that the attack had cost them dearly; 11 Officers and 178 Other Ranks were killed, wounded or missing. Harry was one of the missing. This camp was established to provide a labour force to work on the Berlin to Baghdad railway. 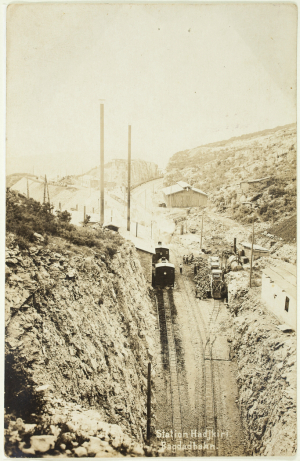 This large construction project had started many years before the war and large sections of it had been completed, but there was still large sections, especially in the rugged mountainous areas that needed to be completed. 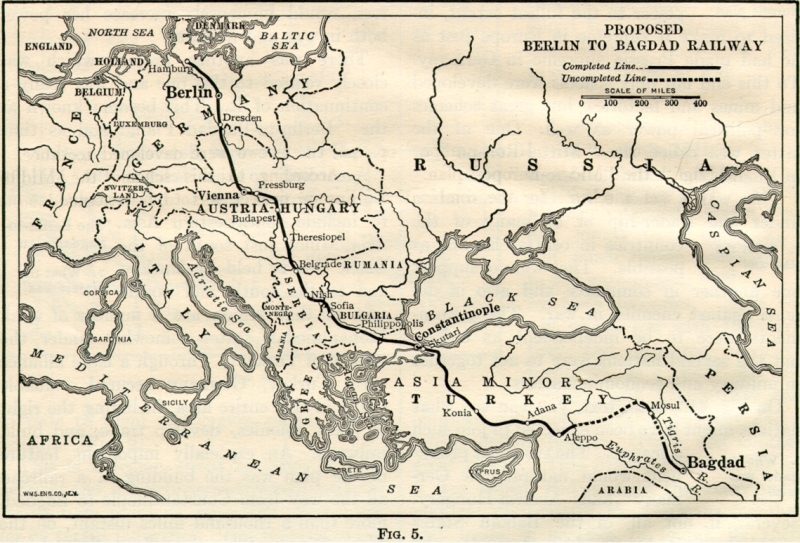 With the outbreak of war, this line became more important to the Turkish as it would strengthen their links with their ally Germany. Harry was captured with two other comrades from the 5th Suffolks. We do not know if they were held together or if they even knew they had all been captured. Harry was initially held in Constantinople (present day Istanbul), he was later moved to the Belemedik POW camp in Taurus Mountains of southern Turkey. Conditions for the prisoners in the camps were variable depending on the guards. Although it must have been extremely difficult to survive. In addition to the hard labour that the prisoners had to endure, they would have received very little food and disease was rife. On the positive side, prisoners were allowed to write home and relatives could send packages. We know Harry wrote a number of post cards home but delivery was spasmodic. In October 1916 six cards were received together and he “appeared to be all right”. Nothing more was heard until December when his wife was officially informed that Fred had died of dysentery on 17 September 1916. He was 38. Harry was buried at Hadji Kiri cemetery. After the war it was difficult for the Commonwealth War Graves Commission (CWGC) to maintain Harry's grave and so his body was moved to Bagdad (North Gate) War Cemetery where he lies today. Harry's wife left behind with six children, re-married after the war. She married Alfred Oxford who had served with the Bedfordshire Regiment during the war and incredibly survived the war even though he was on of the first troops to arrive in France. 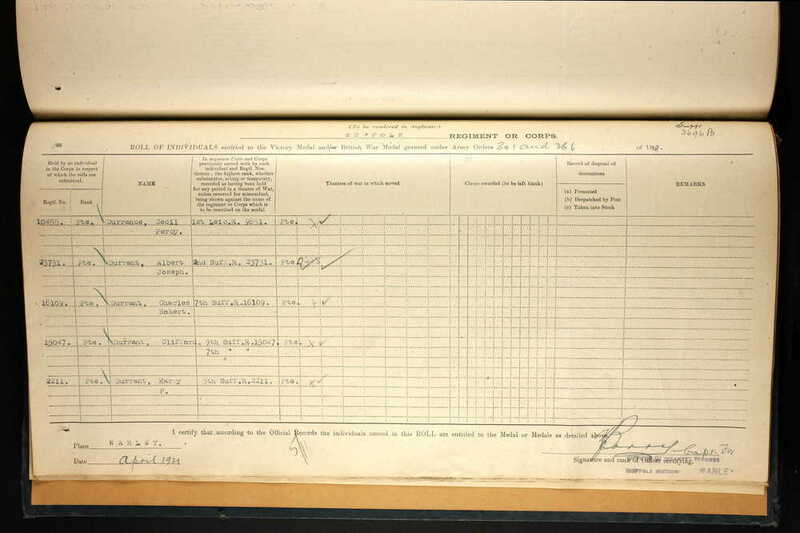 His Medal Index Card says that he arrived in France on 16 August 1914. Maude and Alfred had one more child, Stanley Oxford. Like his father and his mother's first husband, Stanley later answered his countries call during the second world war and saw active service in Burma. Harry Durrant's daughters in the mid 30s. 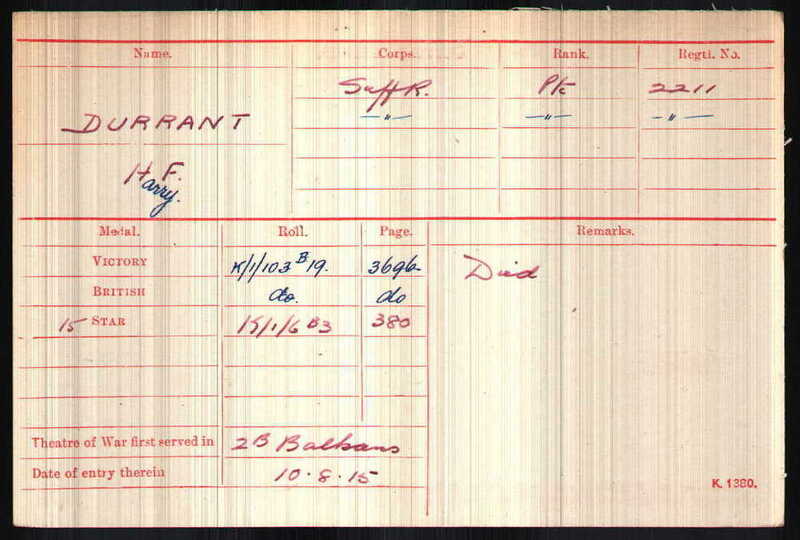 We hope that this page has been able to tell the story of Henry (Harry) Frederick Durrant. If you know of any information which might help to add to the story then please get in touch.